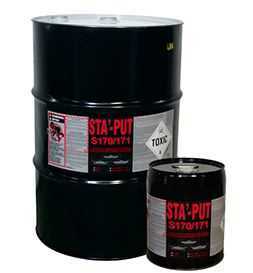 STA’-PUT® S170/S171 is a non-flammable, solvent based, high solids contact adhesive specifically formulated for use in bonding a wide variety of materials, including decorative laminates, plywood, particleboard polyurethane foam and rigid plastics. S170/S171 exhibits ease of sprayability, long open tack, and aggressive grab with high green strength. S170/S171 also offers a long open time.